Bonnie Lynn Chmil's practice focuses on protecting the financial interests of businesses and individuals in fiduciary, private client, and commercial litigation and disputes. 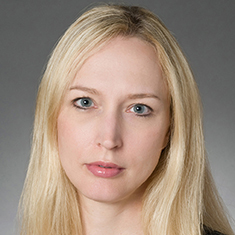 She represents clients in complex disputes involving trusts and estates, real estate, commercial contracts, and business torts. Bonnie has extensive experience representing corporate and non-corporate fiduciaries, trust companies, high net-worth individuals and families, financial institutions, and commercial lenders in both state and federal courts in a broad variety of cases. Bonnie has a demonstrated track record of inspiring confidence in her colleagues and clients and earning respect among adversaries. She has been recognized as a Rising Star by Super Lawyers in 2014–2015 and among the Private Client "Ones to Watch" 2017 by Legal Week. Bonnie brings to her practice a dedication, depth of experience and practicality developed during her years of service in the financial services industry, while attending college and law school at night. Her commitment to the legal profession extends to her robust pro bono practice. Most recently she successfully obtained asylum and permanent resident status for a teenage client from Guatemala, and a grant of executive clemency from President Obama for an incarcerated client who had been serving a 30-year sentence. Bonnie was honored for her work in 2013 with Katten's Pro Bono Service Award. Shown below is a selection of Bonnie’s engagements. Successful defense of a global trade credit insurance company against tort claims in which the plaintiff bank sought in excess of $42 million in damages; dismissal was affirmed by the Appellate Division, First Department. Representation of a national banking association in its capacity as corporate trustee against claims brought by beneficiaries pertaining to a property sale, in which the plaintiffs seek in excess of $100 million in damages. Representation of the executors of a $279 million estate against claims brought by family members seeking in excess of $85 million. Representation of a global financial institution in various litigations arising out of a $400 million Ponzi scheme. Representation of a minority shareholder in breach of fiduciary and related claims against the officers, directors and majority shareholder of a privately held company. Representation of beneficiaries in multi-generational family trust disputes. Representation of an international trust company in a dispute involving a Manhattan condominium. Counsel in achieving a favorable settlement of a beneficiary’s claims against a multibillion-dollar estate. Representation of lenders in various commercial project disputes, including a luxury condominium development project in Manhattan; a mixed-used project anchored by a luxury hotel in Paradise Valley, Arizona; and various commercial properties in New Jersey and Texas.